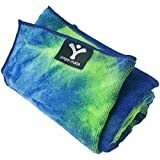 Yoga Mate Perfect Yoga Towel – Super Soft, Sweat Absorbent, Non-Slip Bikram Hot Yoga Towels | Perfect Size For Mat – Ideal For Hot Yoga & Pilates! Super soft, ultra-absorbent microfiber yoga towels perfect for keeping you in pose and dry during your yoga practice! The perfect towel to take to your yoga, hot yoga, bikram class to stay grounded and dry! SCROLL UP & ADD TO YOUR CART NOW!! !